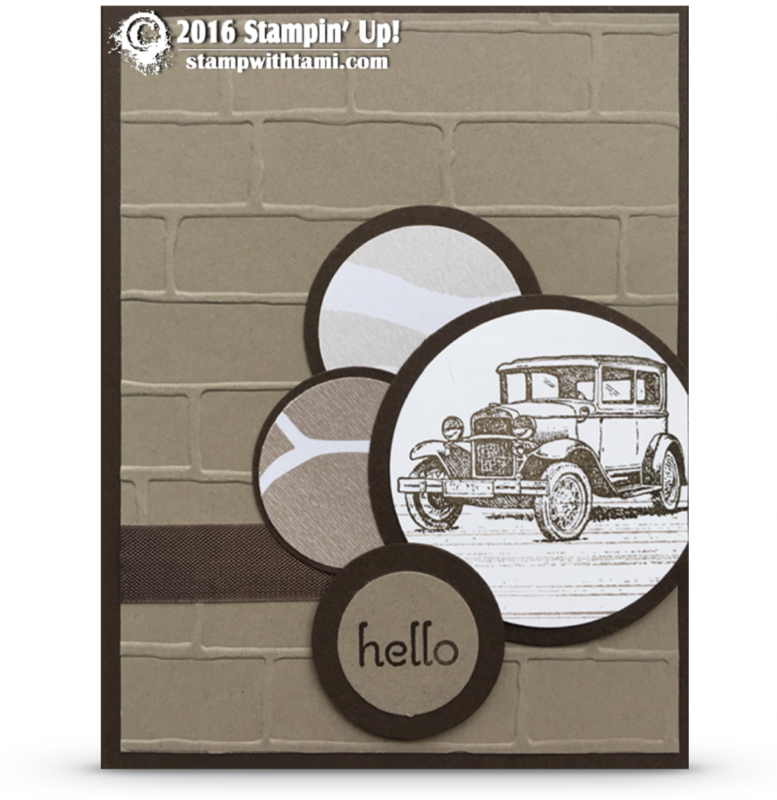 Welcome to the Crazy Crafters Blog Hop with our Special Guest stamper, the amazing Tami White - we are thrilled to have her join us this month and so excited to CASE (Copy And Selectively Edit) any project that has been created by her. We hope you find great inspiration from the projects. Whether you are starting the blog hop here at my blog, Stephanie Fischer - The Crafty Thinker, or have come from the person before me, be sure to click on the person listed under me further down the page to continue your journey on this blog hop. I hope you've enjoyed this card and I welcome your comments. 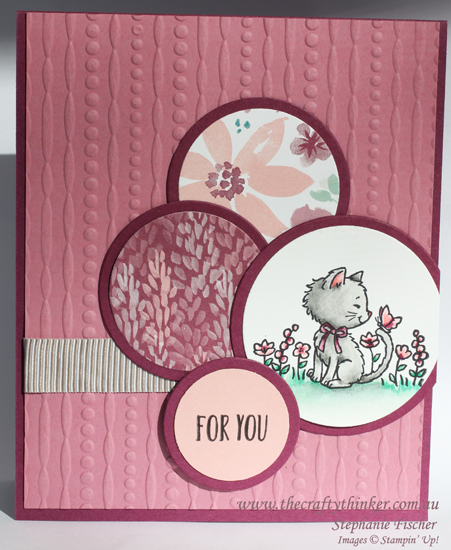 I chose this card of Tami's as my inspiration piece. I've never used circles in this way and find it a very interesting design. I was keen to see if I could use a similar layout for a feminine card. This is such a sweet little cat image! I bought the Pretty Kitty stamp set because not only do I like cats myself but several of my friends and family members describe themselves as crazy cat ladies! I took this opportunity to ink it up for the first time. I watercoloured it with Smoky Slate, Basic Grey, Blushing Bride, Flirty Flamingo, Sweet Sugarplum, Mint Macaron and Emerald Envy inks. I used the Festive embossing folder and Tip Top Taupe mini striped ribbon to set off the Blooms & Bliss DSP, Rich Razzleberry, Blushing Bride and Sweet Sugarplum cardstock. I cut the circles with the Layering Circles dies. 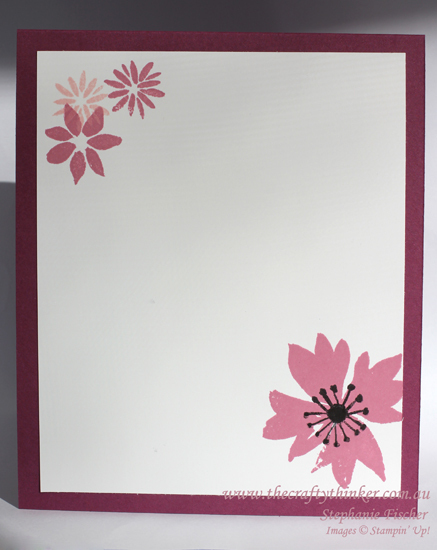 I used the Blooms & Wishes stamp set with Sweet Sugarplum, Basic Black and Blushing Bride inks for the inside of the card. Thanks for taking part in our blog hop. Remember that currently you are at my blog - Stephanie Fischer - so click on the next name in the list to ensure that you don't miss out of seeing any of the blogs and the amazing inspiration they contain.